Although it can be a valid strategy to advertise for your own brand name using Google AdWords (and potentially for your competitors’ brand names), many people don’t look to see if there is actually anybody competing for those keywords. If you rank number one for your brand name (which in most cases you ought to) and there is nobody else advertising for it, then putting up a paid ad above your organic listing is just burning money. See the example search results below; for a national business I wonder how much money they are wasting in clicks via Google AdWords that would have come naturally for free anyway? This doesn’t just apply to your brand name however. If you rank number one for any keyword search organically and nobody is competing in the AdWords field for that keyword then you’ve got to have a very good reason to advertise against yourself (there are indeed some niche circumstances when you might consider this). Check your keyword competitors, save yourself some money and stop competing against yourself! Help and advice on Google AdWords in Cambridge, Huntingdon or Peterborough from WebSanity Internet Marketing. Posted in Web Hints & Tips	| Tagged adwords, google, ppc	| Comments Off on Google AdWords – stop competing against yourself! Sometimes keyword research – in preparation for Search Engine Optimisation or Pay Per Click advertising – can seem very dull. The usual approach is to spend a lot of time doing searches on the web for your products and services, looking for people’s use of language around those terms, and even more time in a tool such as the Google AdWords external keyword tool. Why not take a break from this and use the Google wonder wheel to explore the web environment around your products or services in a visual manner? Start by going to google.co.uk and typing in a search. 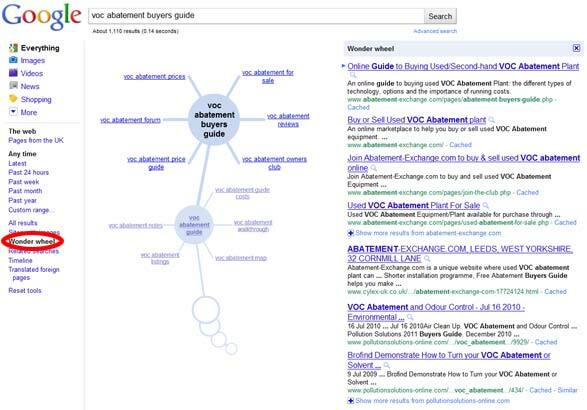 In the results, in the left-hand column that Google shows, click on the More Search Tools link. Within the All results section click on Wonder wheel. Google now shows your central search term surrounded by topics it things are related to this. Click on a topic to see topics related to that, and then repeat. You can step back by clicking on a previous wheel. Note: look at the search results in the right hand column as this shows the search results for the term you just clicked on! OK, in no way is this a replacement for thorough keyword research, but Google’s wonder wheel can at least add a bit of fun to keyword discovery! If anybody is interested in a free Google AdWords training course in Cambridgeshire, then why not come along to the ‘A practical introduction to Google AdWords’ course in Ely on Tuesday the 11th at 17:30. I’m giving this course on behalf of St John’s Innovation Centre and it is free to small businesses in Cambridgeshire. The course is at an introductory level and will aim to introduce the basic concepts and give you the confidence to get started with some simple AdWords advertising. Having good keyword rich content on your site is a fundamental of Search Engine Optimisation. If you think you’ve optimised all your existing content then why not throw in a detailed glossary (ideally one detailed page per entry) to boost your page count, add some very keyword targeted content AND help out visitors to your site?